If you would like the border as in the picture just leave a note in the text or comments box, along with what you'd like inside the border. Thumbprint-like indentations line the tapered base of the personalized Thumbprint Beer Stein, and tiny bumps fill the outside of the base of the mug for added appeal. 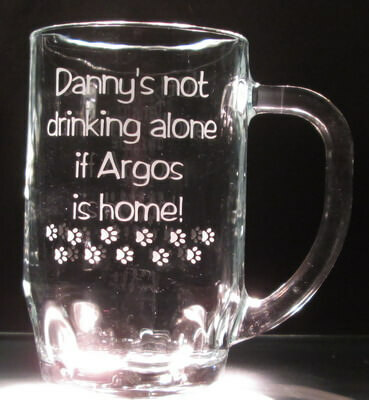 This engraved beer mug has a generous area for engraving. It is 5.75 inches tall and holds 19.5 ounces. 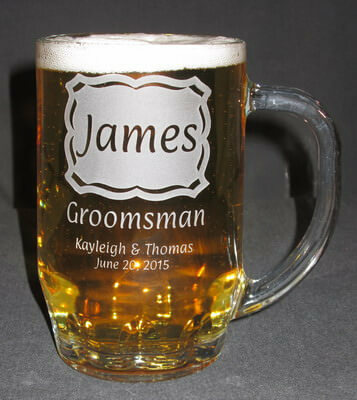 Personalization, text and/or design, on the front of the beer stein is free, other options are available for an additional fee. We suggest keeping your text to 4 lines of 20 characters per line, it is okay to go over, it may just be smaller to fit it on the glass.